Many of you have forwarded the recent NPR feature on paw paws, either knowing we have a Paw Paw beer underway or suggesting that we make a beer from this mysterious tropical fruit. We do, in fact, have a Paw Paw beer currently in fermentation. For those of you not familiar with the fruit, Paw Paw (Asimina triloba) is the largest edible tree fruit native to North America. But you may have never seen one before. The nondescript trees grow in wet, shady groves, often along the banks of rivers. Paw paws taste like mango-meets-butterscotch-meets-banana. In other words, they’re delicious. But the fruit’s notorious short shelf life keeps them from being commercially viable. We forage for wild paw paws around Jordan Lake, and a few North Carolina foragers who know the fruit bring us their harvest. Most of our paw paws come from the amazing Wynn Dinssen, owner of Full of Life Farms in Chatham County. True story: he’s a modern Johnny Pawpawseed. 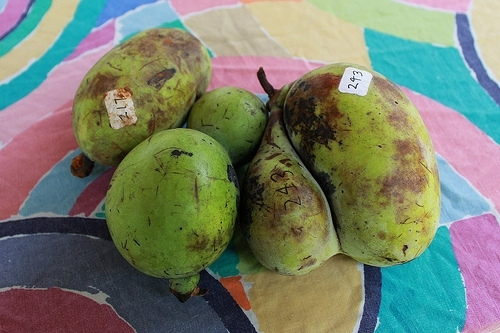 In the late summer of 2011, we collected 75 pounds of native paw paw. Following the September 2011 harvest, we added the fruit to a Belgian-style Golden Ale. The sweet, tropical notes of the paw paw should match up wonderfully with the Belgian Golden’s notes of fruit and spice. We expect the beer to be ready in a month. 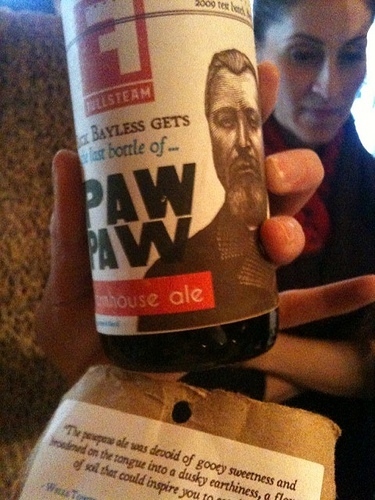 It's a small batch -- draft only -- and available at Fullsteam R&D (our tavern) and a few selected accounts, including José Andrés' America Eats Tavern in Washington D.C..
Last spring, Chef Rick Bayless received the last test batch bottle from the 2009 paw paw harvest. We were stoked! "The pawpaw ale was devoid of gooey sweetness and broadened on the tongue into a dusky earthiness, a flavor of soil that could inspire you to eat dirt. " Over the next few weeks, we'll have more posts on our Paw Paw beer, including pictures of Wynn's paw paw tasting and a brief video interview with the man himself. For now, we wanted to let you know what's fermenting.